Price: $7,799.00 with Free Shipping! American Hood Ventless Exhaust System is Truly the Affordable and portable way to cook! The compact and portable design of the ventless hood provides the perfect alternative when venting through a roof or wall is not feasible. Eliminates the need for expensive roof modifications and venting. 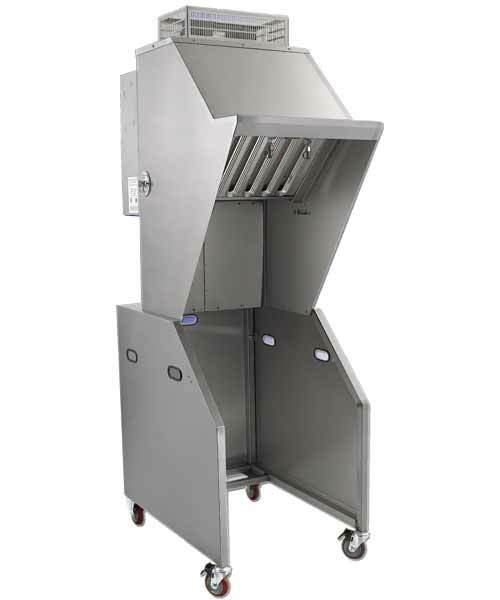 New, innovative triple - filter, updraft technology provides vapor removal requirements for a variety of food service applications and equipment. Has a built in Ansul R-102 wet chemical fire suppression system. Charging and testing will need to be performed by an authorized Ansul Distributor. Constructed of 18 gauge Stainless Steel for durability and polished for aesthetic appeal. Triple filter system designed to trap grease particles while removing smoke and reducing cooking odors. Fully integrated Ansul R-102 wet chemical fire suppression system. Interlocking start is a standard feature and does not allow the fryer or hood to operate separatly. Caster incorporate swivel and locking front and non-swivel back for portability. Base unit includes removable sides for east of cleaning. Color-coded, lighted alert system included to insure system is running safely and efficiently. Limited warranty of one year.